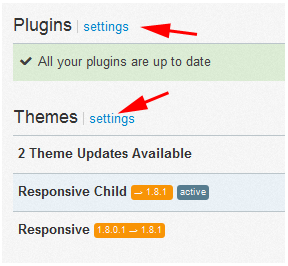 You can fine tune which plugins or themes are updated for a site. If there is a known compatibility issue with a plugin update you can lock that plugin to stop you (or anyone else using the WP Remote account) from updating that plugin. This is also useful if you have modified a plugin – or have some plugins running out of a Git repository which you don’t to be updated via WP Remote. Select your site from the site list to view the site details then click on the Status tab. By default you will only be shown the list of themes or plugins that need updating. You can toggle between this and the full list using the Settings / Updates link. When you click on the Settings link you will be shown a full list of all of your plugins or themes with the ability to lock each one individually from updates. To lock a theme or plugin, click on the checkbox under the lock symbol. The theme or plugin that is locked will no longer appear on the updates list.